I had bought some pineapple yesterday evening and I decided to put it to some use other than making juice or just eating the fruit. 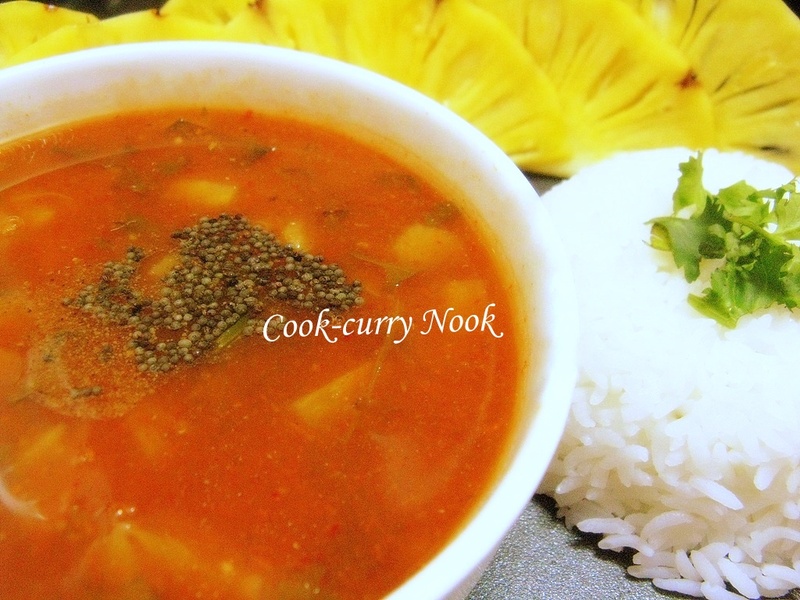 I simply love the tangy, sweet twist of this rasam! Separately blend the tomatoes and 2/3rd of the pineapple into smooth pastes. Keep aside. Chop the remaining 1/3rd of the pineapple into small pieces. In a wok, add the tomato paste, rasam powder, jeera/pepper powder, salt, curry leaves, cilantro and boil for 4-5 minutes. Add water as required, to adjust the consistency. Next, add the pineapple juice and allow to boil well for 5 minutes. Add the chopped pineapple pieces and allow to boil on a low flame for 15-20 minutes. Prepare the tempering and add to the rasam just before serving. I’m sending this to Nithu’s ‘Think Beyond the Usual – Soup, Curry and Chutney with Fruits‘ event. This entry was posted in Events, Rasams, Sambars, Kuzhambus, Koottus and tagged chatpata, chatpata pineapple rasam, fruits in rasam, pineapple, pineapple rasam, quick, quick rasam, rasam, rasam with fruits. Bookmark the permalink. I simply LOVE pineapple rasam. Yours looks mouth watering. I had never heard of it ! Will remember to try it next time I get pineapple. The very many uses of pineapple… pineapple chat, gojju, juice, topping on pizza, pineapple fried rice and now rasam ! Gowri: Try it and let me know how it turns out. Im sure you’ll like it!